Experiments in innovation, design, and democracy that search not for a killer app but for a collaboratively created sustainable future. Innovation and design need not be about the search for a killer app. Innovation and design can start in people's everyday activities. They can encompass local services, cultural production, arenas for public discourse, or technological platforms. The approach is participatory, collaborative, and engaging, with users and consumers acting as producers and creators. It is concerned less with making new things than with making a socially sustainable future. This book describes experiments in innovation, design, and democracy, undertaken largely by grassroots organizations, non-governmental organizations, and multi-ethnic working-class neighborhoods. Elisabet Nilsson is a media, games, and learning researcher. 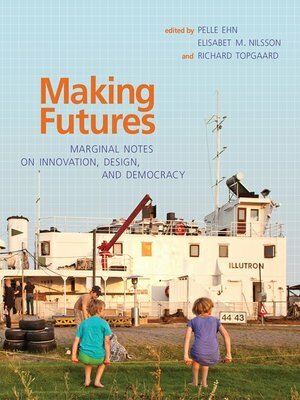 Topgaard and Nilsson coedited Prototyping Futures. Ehn, Topgaard, and Nilsson are part of Malmö University's "digital Bauhaus." Richard Topgaard is a digital media strategist. Topgaard and Nilsson coedited Prototyping Futures. Ehn, Topgaard, and Nilsson are part of Malmö University's "digital Bauhaus." Per Linde is a Researcher at Malmö University. Ina Wagner is Professor at the Institute for Technology Assessment and Design.